The Pubilius Project, which launched last May in conjunction with the Berkman Center's 10th anniversary celebration, has spent the last ten months bringing us op-ed style essays from an array of authors on Access, Security, Rules and Governance, Foundations for Participation, and more. Now the project, which fosters conversations about the evolution of rule-making and governance on the Net, has itself evolved, unveiling a new logo, a new website design, and a new essay from Internet entrepreneur Craig Newmark. 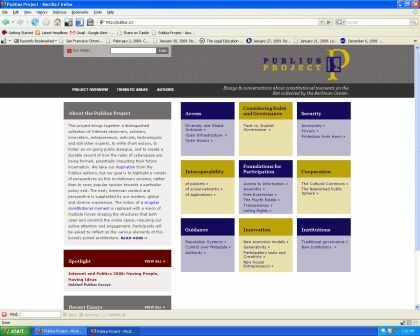 The redesigned Publius website is navigable by thematic area. In addition to the topics mentioned above, users can browse essays on Cooperation, Guidance, Innovation, and Institutions. The Spotlight section features essays on special topics or current events. It currently hosts a series of pieces related to our 2008 Internet and Politics Conference: Moving People, Moving Ideas, and features essays by Ari Melber, Henry Farrell, Sunshine Hillygus, Peter Daou, Matthew Hindman, Dana Fisher, and Gene Koo. This week's new essay is the first of two pieces by Craig Newmark on participation and authority and is the latest edition to the Cooperation topic area: "Can the Web's valued 'culture of participation' co-exist with occasional acts of control?" Craig Newmark, "(not) Newmark's Law"
All of these essays are being published under a Creative Commons license to encourage remixing and broad dissemination. Our hope is that the project will evolve organically, growing with each contribution and progressively uncovering additional relevant issues, worthwhile framings, and insightful perspectives. Please participate in this process by posting your opinions and reactions via the comments sections on the Publius site.